Economic growth is an increase in real GDP; it means an increase in the value of goods and services produced in an economy. Therefore a rise in Consumption, Investment, Government spending or exports can lead to higher AD and higher economic growth. Interest rates. Lower interest rates would make borrowing cheaper and should encourage firms to invest and consumers to spend. People with mortgages will have lower monthly mortgage payments so more disposable income to spend. However, 2009-16 we had a period of very low-interest rates, but due to low confidence and reluctant bank lending, economic growth was still sluggish. Consumer confidence. Consumer and business confidence is very important for determining economic growth. If consumers are confident about the future they will be encouraged to borrow and spend. If they are pessimistic they will save and reduce spending. Asset prices. Rising house prices create a positive wealth effect. People can re-mortgage against the rising value of their home and this encourages more consumer spending. House prices are an important factor in the UK because so many people are homeowners. Real wages. 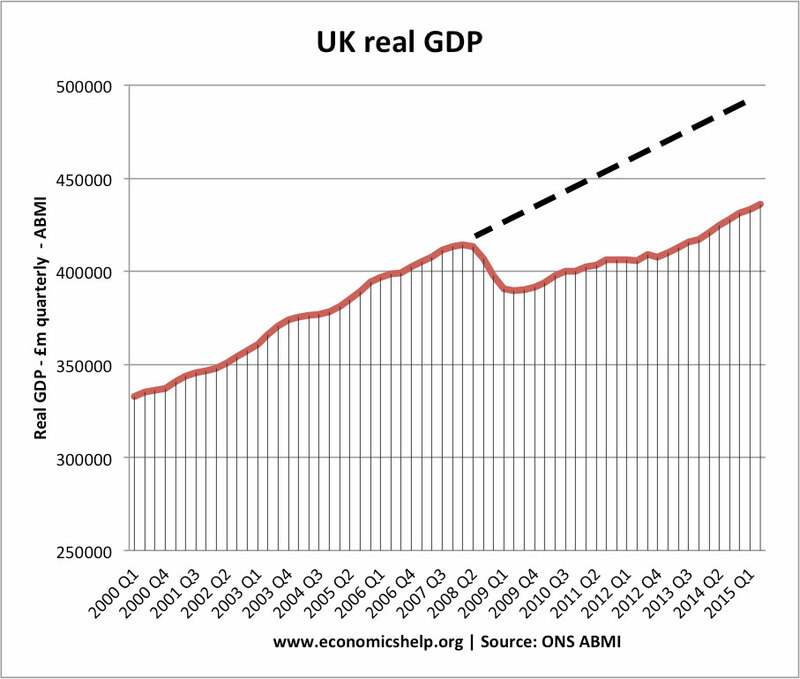 Recently, the UK has experienced a situation of falling real wages. Inflation has been higher than nominal wages, causing a decline in real incomes. In this situation, consumers will have to cut back on spending – in particular reducing their purchase of luxury items. Value of exchange rate. If the Pound devalued, exports would become more competitive and imports more expensive. This would help to increase demand for domestic goods and services. A depreciation could cause inflation, but in the short term at least it can provide a boost to growth. Banking sector. The 2008 Credit crunch showed how influential the banking sector can be in determining investment and growth. If the banks lose money and no longer want to lend, it can make it very difficult for firms and consumers leading to a decline in investment. The average growth in real GDP is often known as the long-run-trend rate. This shows the recession of 2008, caused a loss in potential GDP. In the long run, economic growth is determined by factors which influence the growth of Long Run Aggregate Supply (LRAS). 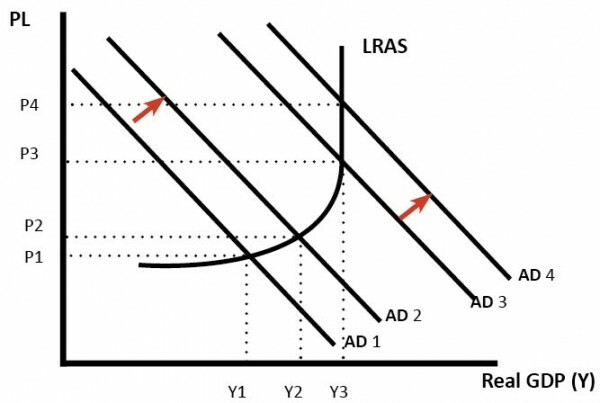 If there is no increase in LRAS, then a rise in AD will just be inflationary. With this aggregate supply curve, the impact of an increase in AD depends on the situation of the economy. 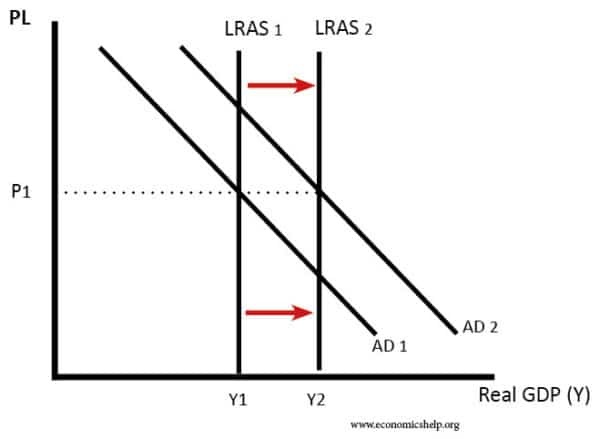 This graph shows an increase in LRAS and AD, leading to an increase in economic growth without inflation. Levels of infrastructure. Investment in roads, transport and communication can help firms reduce costs and expand production. Without the necessary infrastructure, it can be difficult for firms to be competitive in the international markets. This lack of infrastructure is often a factor holding back some developing economies. Human capital. Human capital is the productivity of workers. This will be determined by levels of education, training and motivation. Increased labour productivity can help firms take on more sophisticated production processes and become more efficient. Development of technology. In the long run development of new technology is a key factor in enabling improved productivity and higher economic growth. The strength of labour markets. If labour markets are flexible, then firms will find it easier to hire the workers they need. This will make expansion easier. Highly regulated markets could discourage firms from hiring in the first place. 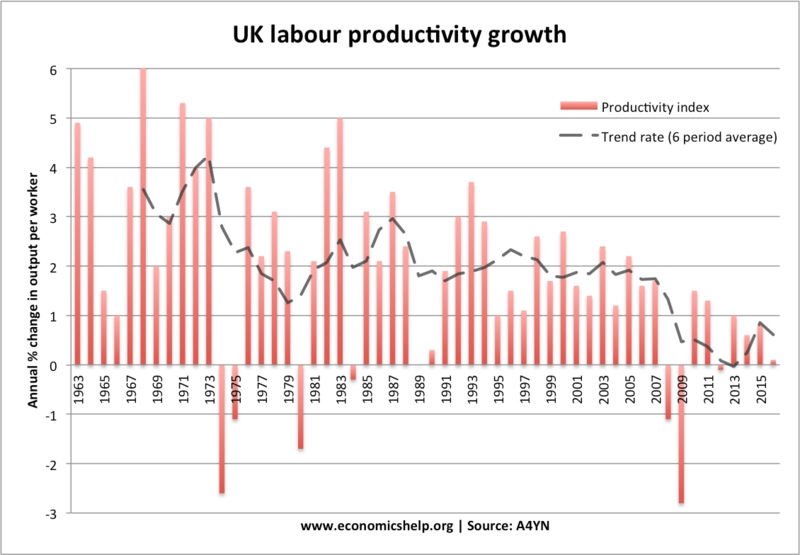 Productivity is output per worker and has a strong bearing on the long-run trend rate of economics growth. Productivity will be determined by technology, levels of investment in new technology and the skills of the labour force. 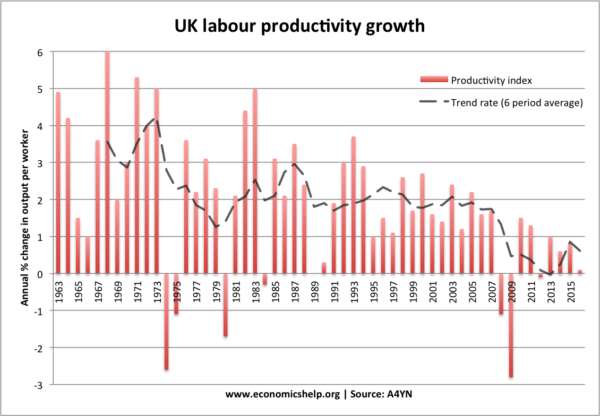 This shows a fall in productivity growth since the 2007 recession – leading to lower rates of economic growth. Commodity prices. A rise in commodity prices such as a rise in oil prices can cause a shock to growth. 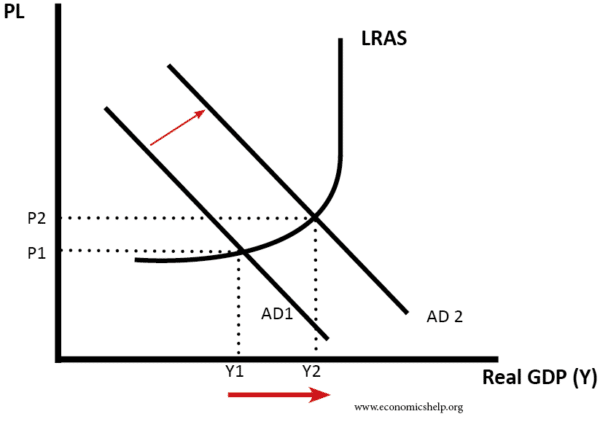 It causes SRAS to shift to the left leading to higher inflation and lower growth. Political instability. Political instability can provide a negative shock to growth. 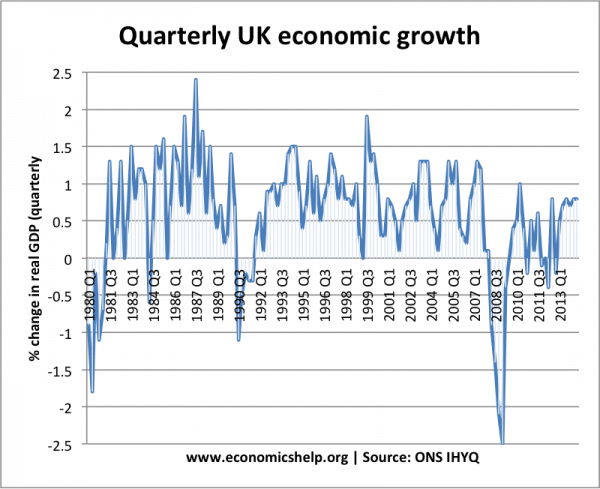 A graph showing quarterly economic growth in UK. In 1981,1991 and 2008 we see a recession. Appreciation in the value of the pound which made exports uncompetitive. Supply-side reforms such as privatisation and tax cuts. 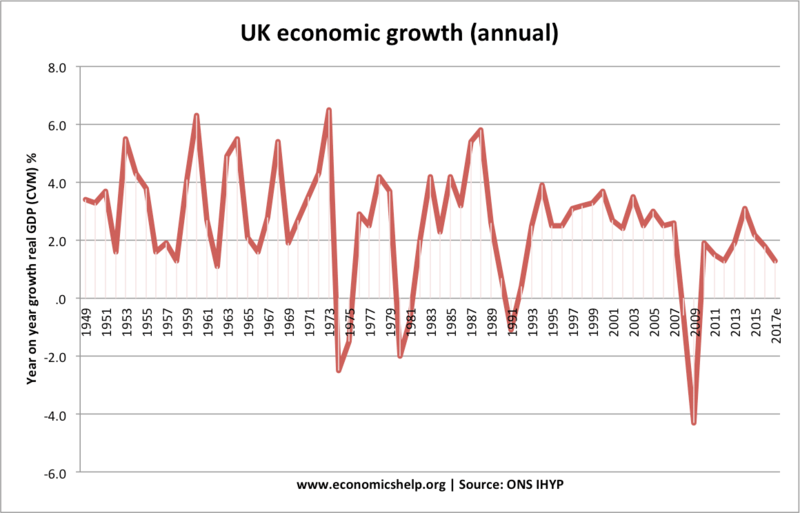 This was a long period of economic expansion in the UK. Stable inflationary environment. Bank of England given control of monetary policy in 1997. Secular stagnation – has the long period of economic growth come to an end? The book on long run economic growth needs to be rewritten. The economy is made up of two activities: moving things and transforming things. The level of economic (energetic) activity within the economy is determined by the amount of energy entering the economic system, and the efficiency with which things are moved and transformed. If an investment increases the supply of low cost energy, or increases the efficiency with which activities take place, then investment contributes to growth. There are many things which contribute to short term growth, which are not sustainable. These include changes in interest rates, pent up demand, stock market changes, housing price changes, sentiment, etc. High sustained oil prices, and high global demand for oil will constrain economic growth. The only way to achieve economic growth in an energy constrained environment is to increase efficiency and productivity throughout the entire economy by a minimum of 2% per year. Without increased access to low cost energy, and without continuous improvement in efficiency and productivity, the economy will remain in the doldrums, experiencing slow or no growth. this is really understandable and easy. Hello, I am Manashri and I am a student. I like economics subject and i wanted to choose a topic in economic growth for my research paper? May I know how effectively i can write a topic on economic growth? What will be thesis, methodologies, literature review?